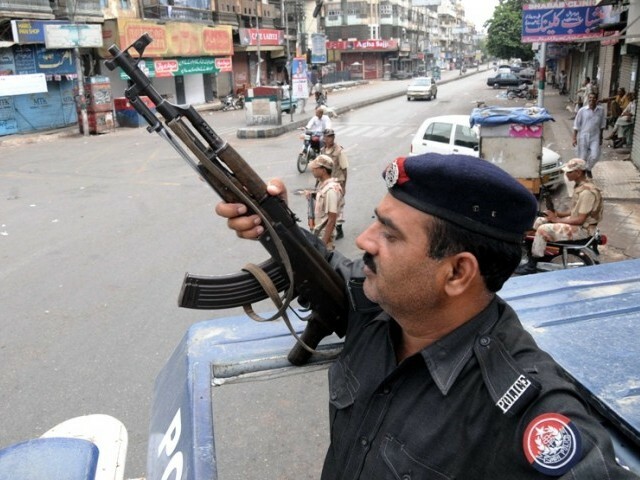 PPP top brass decide­s to use Ranger­s, police to conduc­t ‘indisc­rimina­te surgic­al’ operat­ions in troubl­ed areas. 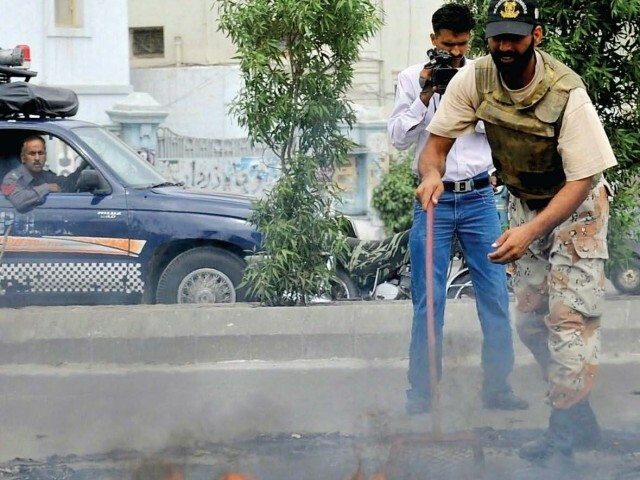 Defying a growing chorus seeking Army intervention to stop the Karachi violence, top leaders of the ruling Pakistan Peoples Party (PPP) dismissed any possibility of looking to the General Headquarters for help to restore peace in the city. Instead, they decided to use Rangers and police to conduct ‘indiscriminate surgical’ operations in troubled spots of the city. “Calling in the Army is out of the question … there is zero per cent chance of going for this option even in an extreme situation,” a party leader told The Express Tribune after a meeting of the PPP core committee, chaired by President Asif Ali Zardari. Attended by Prime Minister Yousaf Raza Gilani and key party leaders, the meeting that continued till midnight also decided to seek support from all political players with stakes in Karachi but insiders appeared to be casting doubts on whether the PPP will continue to pursue the Muttahida Qaumi Movement (MQM) as well. Interestingly, Interior Minister Rehman Malik and Sindh Senior Minister Zulfikar Mirza were not present in the meeting. The two leaders had an exchange of harsh words during the Sindh cabinet meeting on Monday. A handout issued by the presidency said that Zardari spoke to Awami National Party (ANP) Chief Asfandyar Wali Khan during the meeting but a participant said continuation of cooperation with the MQM was not discussed. Another PPP leader who attended the meeting said there was ‘disappointment’ in the party ranks on the way the MQM had rejected cooperation offers by the president and the prime minister. An insider said the PPP will resist calls by its allies and opponents to hand over Karachi to the military. “Most of us are of the opinion that calling in the Army will further complicate the situation,” a participant added. According to the statement, the committee put its weight behind the provincial government’s efforts and initiatives to restore peace in the city. Briefing the media, presidential spokesperson Farhatullah Babar said that the participants appreciated the decision taken by the Sindh government to take stern action against extortionists and criminal elements in different parts of Karachi, regardless of party affiliations. During the meeting, the president also called the Sindh chief minister to assure him the PPP’s full support. Babar said the CM informed the president that it had been decided to set up an operation room in Karachi to keep an eye on incidents of lawlessness in the city, monitor action taken against criminals and provide relief to victims of violence. In a bid to exert greater control over security of Karachi, the Sindh government has decided that entry points into the city will be reduced. This was decided at a law and order meeting, co-chaired by Sindh Chief Minister Qaim Ali Shah and Interior Minister Rehman Malik, at the Sindh Chief Minister House on Tuesday. 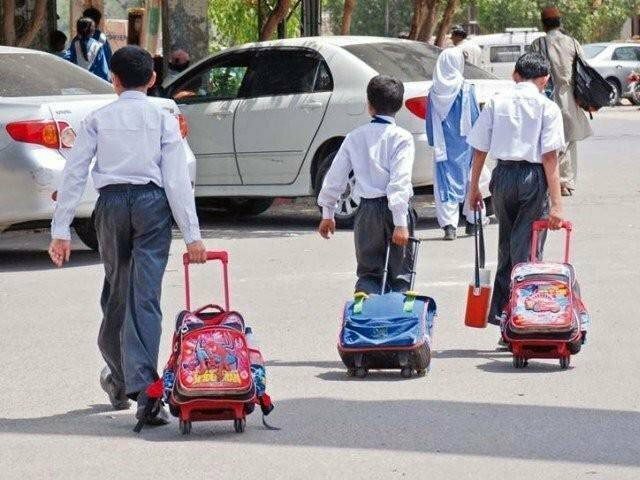 The decision is aimed at restricting the movement of arms and inter-provincial routes will also be snap-checked. 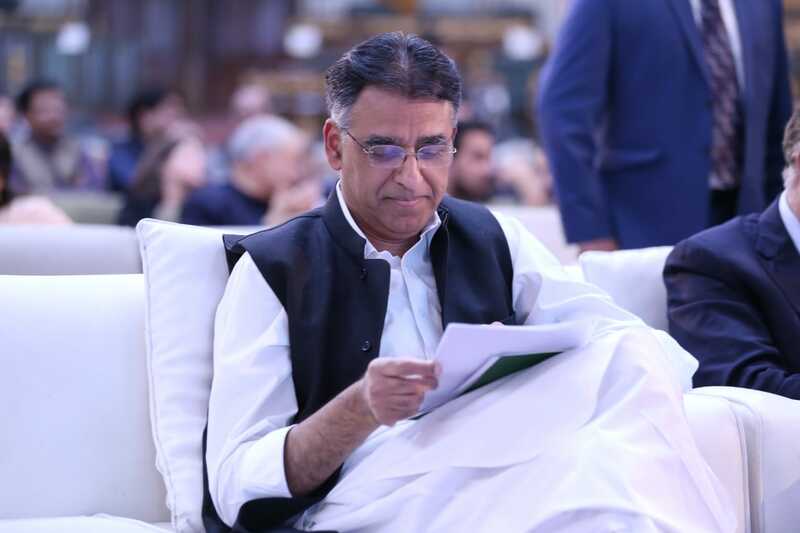 The government has also warned 25 banned Jihadi and sectarian organisations, including Lashkar-e-Jhangvi and Sipah-e-Sahaba, to immediately stop their activities and close their offices, otherwise strict action will be taken against them under the Anti-Terrorism Act. “We have warned these terrorists to either leave the city or face the consequences,” Malik told the media after the meeting. Regarding ‘no-go’ areas in the city, he said the government will demolish barricades in areas where it has been difficult for the police and law enforcers to enter. The interior minister said that the government has prepared a video of detained target killers, which will soon be released. Sources privy to the meeting said that, initially, nine areas, including Lyari, Korangi, Orangi and Qasba Colony, have been selected for a surgical operation to be conducted by the police and Rangers. The meeting was also informed that six extortionists have been arrested and the government has warned others to leave Karachi immediately, else stern action will be taken against them. Published in The Express Tribune, August 24th, 2011. Action is needed now or ‘someone else’ will come to play a role, warns Gilani. Firdous Ashiq Awan says Pakistan is going through crucial phase in its fight against terrorism. Say police and Rangers have proved ineffective at controlling the situation. “Leave Karachi and come back after we appease people. Then you are free to continue” That’s what I hear. Only in Pakistan are criminals warned before an operation. This proves that the government scared taking the criminals head on. They would rather that they disappear rather than bringing them to justice. Pity. so i guess they can leave karachi and then do whatever they want ?? Our leaders warned extortionists to leave Karachi and they leave karachi so easily? if they leave karachi this is the biggest achievement of SINDH GOVERNMENT. Are these crackpot politicians actually allowing these criminals to get away? Does any one need any proof of complicity an more? From No drone attacks to leave Karachi. A party with its so-called deep roots in Sindh has weakened itself to such disgrace. Has any miscreant, terrorist, mafia ever paid any heed to such warnings? This is an open admittance of total failure of its leadership. If they are unable to take concrete steps then why don’t they resign? This Government and it’s allied parties is like the proverbial ostrich, which buries it’s head in the sand thinking that it’s behind is safe – while it is in fact uncovered. The measures taken are : Closing all entries and exits into other provinces. Do they believe that people from Punjab and Balochistan are responsible for the violence in Karachi? Targeting banned groups like lashkar and sipah. Do they actually believe that the lashkar has anything to do with Karachi’s violence? Even the sipah is hardly existent. This is a govt. in willful denial. They will not take meaningful action. Leave Karachi why not leave Sindh!! This is what happens when the people give their hard-fought independence away to waderas and jagirdars in the disguise of politicians. They pit you against each other and enjoy their own perks and privileges. Their children get educated in Oxford and Cambridge while yours have no schools. They get treated in the best hospitals of Europe and America while you rot in hospitals with no medicines or doctors. Keep on fighting each other and keep these politicians in power by voting them in based on language and ethnicities. And keep on getting killed on the streets like cattle. OR rise up and make the right decisions and drive these politicians out. The choice is yours. No one is going to come from anywhere and save you from your own miseries. There is a lot of difference between issuing joint statements telling us that “people’s lives and property will be protected at all cost” and actually protecting the innocent citizens, no matter what language they speak. Joke? Is it a new decision or restructuring of the old one? Being controversial = Being popular in the world of politics, when you people will learn.Such a waste that you even thought to comment on it. And i say this again, for heavens sake and for the sake of those who have really served this nation, please stop calling them OUR LEADERS. Have some pity on you and stop looking for leaders. Be the leader yourself. You must read it this way…”Please, please, leave karachi”…..
Is that a joke? Leave Karachi and take your ‘dhandha’ somewhere else? Neither the government is capable of maintaining law and order, nor the government wants Army to intervene? What is this going on? Either you do it yourself and make sure that not one more single person should be killed in target killing in Karachi, or let the Army do the job. You cannot sail while keeping your both the feet in two different boats. Things are different now. In the last Corps Commanders meeting, the situation of Karachi has been discussed at length. The present political government of PPP has no more time. Either you do it to save your government, or leave the matter in the safe hands of Army. No earth shaking event . Lazy government! May Allah bless our nation with peace and unity! Running for the hills on just a notion are you now..?? What do you know or care about Sindh or Karachi.. Probably they should all go to their home in KP where they belong the first place. Are you implying only a certain race is involved in crimes? What do you know or care about the rest of the country? Interesting observation about the security situation in Pakistan: Where army operations are taking place people protest and call for negotiations. Where negotiations are taking place people protest and call for army action. No wonder Pakistani leaders have no idea what they are doing. They are merely a reflection of their people – dazed and confused. @Natasha why should Karachi keep all the filth and dirt? since the govt seems gutless.. perhaps we must turn towards our American bros ;) and request for precision drone strikes on the miscreants.. clearly the country democratic set up has failed..
Because karachi is the capital of Afghanistan. Awww that is such a sweet request from a gullible and childish government. No way the killers can deny it now, can they? The situation is being created so that there is no other option left other than Army’s intervention. This will weaken Army which is already overstreched over so many fronts. Once Army gets sucked into Karachi situtation and it will become difficult to get out, things will start heating up in Balochistan and KP. And then something will happen on eastern border which will become a 1971 like situation. The situation and circumtances are being engineered to a 1971 like situation for an an end result leading towards breakup of the country. The problem is Karachi specific. And I never asked you to ‘keep’ them. There’s no question about ‘should’. Clean them up. @Natasha – What do you mean deal with it? Questioning to care about only one city/province? (not that i support Fahad’s comment, i dont) What are you implying by saying deal with it?! This is and should be troublesome / traumatic / problematic for ALL pakistanis whereEVER they are. If a persons house is on fire and him and his family trapped inside, will you stand outside like a spectator and say deal with it? Or you will go and fetch some water and help put it out? I guess thats the pakistani way…right? We stand there and watch. What rally’s, protest’s, petition’s or any sign or responsible citizenship has the rest of Pakistan showed in these horrific times? Aik doosray ko boltay hain, apnay gireban main koi nuhee jhaank ta. Rehne dijiye. Bas. It is high time…for the people of Pakistan to come together as ONE NATION…. This whole “leave Karachi” or “deal with them in Karachi” talk is nonsense. Eliminate them. Put them behind bars or allow the US to run drone strikes to destroy them. Why is it that our great Pakistani government warns terrorists when the Army is coming to attack them so they can run away and warns miscreants when the Rangers are after them? It’s as if our nation is run by the terrorists and miscreants – oh wait, it is! Oh I learn so many new phrases from Pak politics. Just remember —- you voted these incompetent people into office — reap what you sow. Does the man realise he is the interior minister of Pakistan not the home minister of Sindh. We all thought three years was enough time for him to understand the sheer immensity of the office his equally dimwitted benefactor has gifted to him. At the end of the day,TALIBAN will be blamed by the Govt.to satisfy nation about karachi surgical operation. @Ranjit: Keep your hate to yourself. You represent the type of people who had refused to address the concerns of the Muslim community in India to the point that Muslims ended up asking for a separate country. Otherwise, people who wrote: “sare jahan se achcha hindustan hamara ; hum bulbul hain us ke, woh gulistan hamara” would not have ended up asking to leave. And, this applies to us also when we mistreated our own Bengali brothers to the point that they had to ask us to leave. But you are no better so do not spew your hate around needlessly. There is only one solution of Karachi situation…”Get used to it”. There is no end to this senselessness… even the technically literate, educated and ‘should be’ enlightened people of our country can not raise themselves above this stupid race and provincial mentality, which is so very obvious after reading these comments…what hope does this country has??? If there is anything Quaid should be embarrassed about, it is his misjudged and misguided thinking that the people he thought of as one nation separate from the others in India will ever be one. Shame on us, for we deserve what has become of us. When Mr. Bangash talks about system based instead of personality based country, he has the history of last one hundred years of Pakistani struggle for its creation and then its survival. Why Pakistan started moving towards its failure just after its birth? The political institute of the country revolved around one person only. His removal from the scene let ‘extras’ occupy the stage, which were unable to govern effectively. And since then every political party or ruling elite has been controlled by one individual. Imran Khan has the ‘charismatic’ personality, but PTI minus Imran Khan is insignificant. He like any other ‘charismatic’ person believes in his ‘value’ and ‘importance’, and ignores others. He is not popular in Sind and Baluchistan and alienation of almost half of the country is not good for PTI. Imran is the only hope, but damned the public of two provinces if he is a looser in elections, and damned the public of other two provinces if he wins. So what is the choice! Only God knows. Because with present lot in power, Pakistan and Imran don’t have sufficient time to reduce the downslide, or organise PTI as a reckonable force. Having been employed as a senior officer in a Karachi based company (the (unofficial) owner being a very dear friend of the the dude running the show in Islamabad) I can confidently say that the current PPP leadership has no interest in the provision of services to the people of Karachi. Their aim is to take as much from the Pakistani economy prior to the Supreme Court giving them little option other than to leave the country – of course by that stage the embezzled billions will be safely invested in countries such as Dubai and Abu Dhabi. True story! “Army under no circumstances” … huh … these people know that army will whip them to death. The interior minister of is the minister of Karachi only, he want from the terrorist, either to leave Karachi and go to tribal areas and start fight there Karachi is not the place of terror, or they will send army to control over the city. The fire over tribal area will spread over entire Pakistan, Karachi was the first place after FATA and then we will have this fire in Lahore and other cities of Pakistan. LEAVE and rest for a while in Presidential Palace, you may also get chance to discuss future strategies, elections are in sight of course. @Cauitous – the votes were only for BB and not for her family after she died. The current leadership came by default and not by choice. So, in essence it is not democracy. well army was mobilized in minutes to fight american war against so called terrorism in frontier…. now when the real terrorist groups in form of MQM, PPP, ANP are carrying mass murders in karachi…. we hear nothing from army top brass… where is the resolve to end terrorism…. Yes. One thing is clear that the culprit belongs to other cities may be in interior Sind, it is why they are asked to leave Karachi. Karachi wala can not go any where. Why so much drarma for surgical operation, if you are serious enough to bring peace in this city this should have been done six month earlier without propaganda. Well, the asking them to leave thing is certainly worthy of being ridiculed for. But, no military is a good thing. Pakistan needs the police and other peace keeping/law enforcers to do their job or learn how to do it quickly or this crap is just going to keep happening in another place at another time. I can see people replying and accusing me of not valuing the lives of people and condoning it dragging out. But, that’s really not the intended way for it to sound. When it comes to the peace keeping/law enforcing agencies I mentioned, they wouldn’t even exist if tragedies and needless loss of life don’t happen. It’s just a difference between today and next year. They have to get their crap together. The army could intervene, but they wouldn’t be permanently stationed there. It’ll be back in the hands of law enforcement eventually and if they don’t start doing their job right it’s just going to happen again. 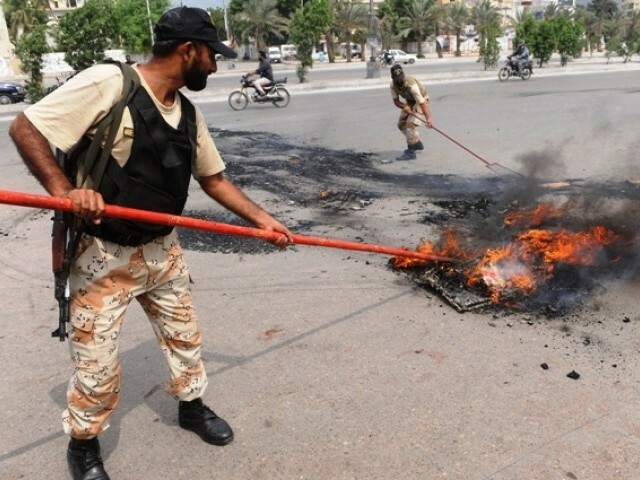 Karachi Should be Handed over to the Army to Restore Civility on a permanent basis. Army should move in only with full powers of trial and awarding punishments to all criminals in Summary Military Courts, regardless of any political affiliations. It is in the interest of all the extortionists to stop fighting and extorting so the economy can improve and the pie slices get bigger. The more they kidnap, steal, threaten, the more businesses will pack up, leaving them with less and less! Basically it is turf wars over money extraction. And somehow many justify it on account of being forced to do it! Just an indication of how confused we are over right and wrong. Taking money from others through violence or threats without working can never be justified. Under no circumstances. . . . is their slogan! Even if the whole city has dead bodies laying around, these leaders do not want the Army protecting it at any cost and the Army is quite and obedient to the leadership at all cost regardless of the bleeding nation. Karachi’s nightmare to be remembered as inaction and complacency by all in authority due to greed which amounts to disloyalty to the nation.